The beginning of a new month means it is time for a book review! 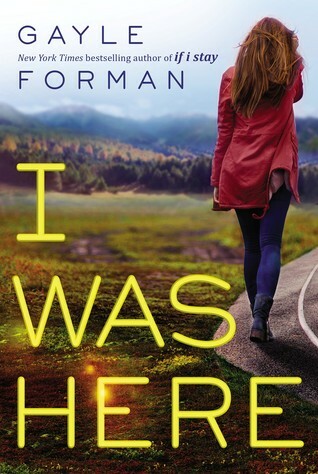 This month Steph picked I Was Here by Gayle Forman. This is a young adult novel and I wasn't quite sure how I was going to like it. I don't usually pick up young adult novels to read unless I need to read it for school with my students. In the story, Meg and Cody are best friends. Meg has gone away to college and while there, commits suicide. Cody goes to pack up her belongings and realizes there is a lot she didn't know about Meg. Cody digs into Meg's computer and discovers missing emails and encrypted files that lead her on a journey to discover why Meg chose to take her own life. This was part young adult novel, part mystery for me. Once Cody got to Meg's college and started finding out how much she didn't know about Meg, there were so many questions I wanted the answers to. I couldn't put this book down, waiting to see what Cody would find out about Meg and if we would ever find out what led to Meg's suicide. Throughout Cody's "investigation" we also see what she discovers about herself and her role in Meg's life. I would definitely recommend reading this book and I want to read the other books by Gayle Forman. For October, Michelyn has chosen Eight Hundred Grapes by Laura Dave. While looking for this book at the library, I read the book jackets of others by the same author so I am very intrigued to read this one. Would love to have you read October's book along with us! Any book suggestions? I'm always looking to add to my list!